packers | Blog, Jane! Blog! That’s right. 7 straight wins to start off the year! 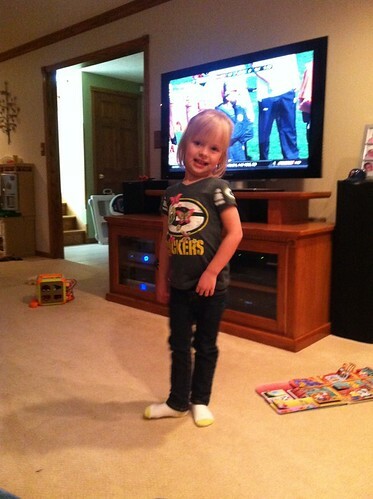 And here is Maria posing in her Packer shirt! In Sam’s Club today, Maria saw this chair and pointed and said “Packers” !!! This evening, Maria looked at me and said “Potty” and grabbed her pants. I took her hand, we went into the bathroom. I asked her if she wanted to sit without her diaper (which she hasn’t done before) and she did. I left to go get her a clean diaper, and when I came back she had pulled her pants back up and I noticed she had actually gone in the potty! My daughter went potty with no prompting!! This guy likes to keep me up late! Brett Favre!! Wow… another nailbiter, but what an exciting ending! MNF is not my favorite now. Because, frankly, my Monday nights are now filled with things like baths, and bottles, a bit of rocking (or like last night, a LOT of rocking!) But, that is why we love our DVR!! But I often get frustrated when it comes down to the end of a game. I like the Packers to be winning by a lot, so I can go to bed early… or losing, but really, I don’t like to see them lose at all! But to go into overtime… not happy! Although, if you’re going to have an overtime, I like it to be one long Brett Favre pass for a touchdown! I can handle overtimes that last 15 seconds! The Packers are 6-1!! yeah!!!! In honor of the Packers playing on National TV tonight… Go Pack Go! Chad is not pleased about this outfit, but I figure he can’t resist how cute she looks! And she loves the pom poms!